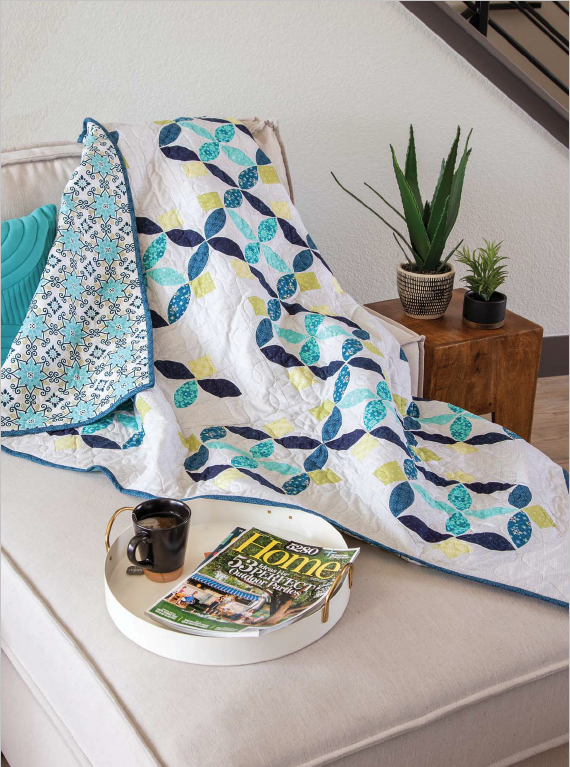 Have you ever made an orange peel quilt? This classic design gets a modern update from Shelley Cavanna! 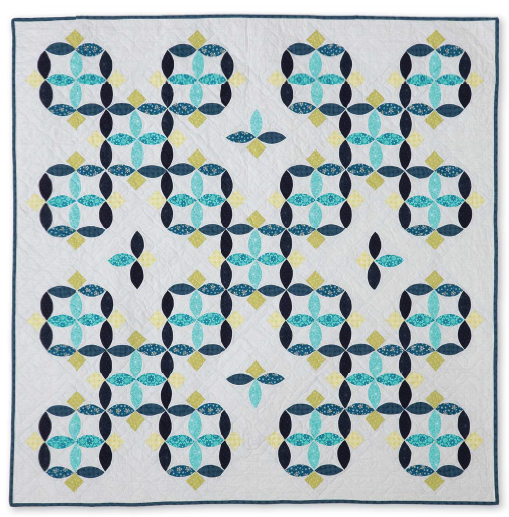 She used the fresh teals, aquas and limes from her Gloaming collection to create "Cornflower Maze" for Quilty Magazine. What inspired you to create an orange peel design? After taking a curved piecing class at QuiltCon a few years ago, I started playing around with incorporating squares and curved orange peel pieces in a design. 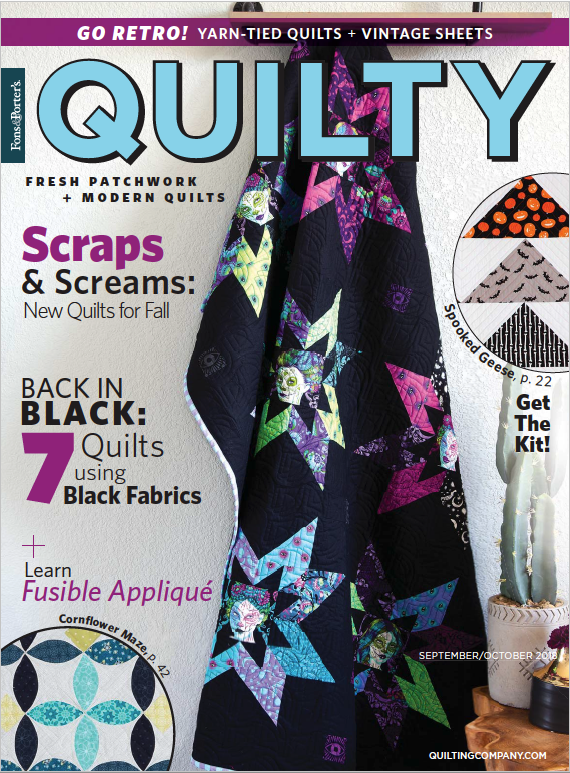 The magazine pattern actually uses fusible applique instead of curved piecing, which is an even faster way to make the quilt. How did this block come together? To me, it looks like dragonflies. The tail ends are the lighter parts in the center, and the lime squares are the heads. So each block has four dragonflies. The tails also come together to look like a flower. 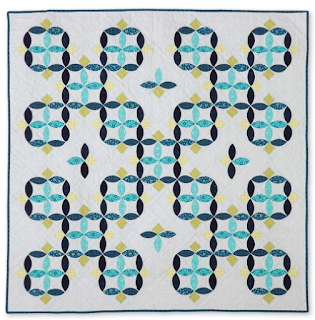 A version of this block was featured in one of Quiltmaker’s 100 Blocks issues. I had used the block to create a bunch of different quilt designs, and Cornflower is one of them. Tell us more about the quilt. I originally mocked up the quilt using the one block over and over. 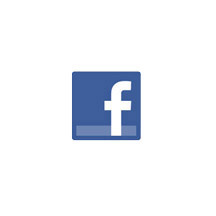 But it seemed like too much—the design got muddled and less interesting. I also like having some sort of secondary pattern in my quilts, so I took out some blocks to create open space, and then added in more orange peels. It created a maze look that really appealed to me. How did you decide on color placement? I balanced out the light and dark color values of my Gloaming prints, and it seemed to work best to have the tails be lighter. The darker blues definitely create a maze. I think it’s a fun take something that’s traditional (the orange peel) and update it to make it modern. I’d love to see this on a black background, turning the dragonflies into fireflies. Or using florals to create flower blocks. It’s an allover design. My long armer uses clear thread, and I think it adds some nice texture without distracting from the design. Click here to visit Shelley's website. Click here to purchase the Cornflower pattern. Orange Peel is on my quilty bucket list. Beautiful Teals and blues Shelley!